While I am talking to you mothers and fathers, I give you one more assurance. I have said this before, but I shall say it again and again and again. Your boys are not going to be sent into any foreign wars. 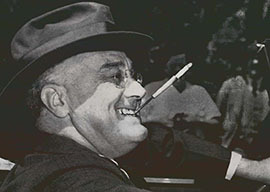 I made the first speech advocating war with Japan on December 8, 1941. This speech was heard by over 20 million Americans and it upheld President Roosevelt’s theme of the ‘Day of Infamy’. I now publicly disavow that speech as a result of subsequent historical evidence. My own view is that the road to Pearl Harbor began at Danzig in the summer of 1939, if not before. It was Roosevelt’s repeated intrigues”chiefly working through the American ambassador to France, William Bullitt, who gave secret assurances to England and France that Washington would come to their aid in any conflict with Germany”that caused the outbreak of war in Europe. When war came, Roosevelt was stymied and incapable of making good on his promises. Why? Simple. Americans were overwhelmingly against active involvement in a European war and so was the U.S. Congress, which was the only entity that could declare war under the Constitution. 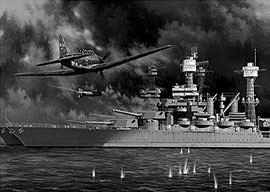 But contradicting all his public pronouncements, Roosevelt tried very hard to get into a shooting match with Hitler in the North Atlantic. Hitler declined the invitation. He had his hands full with the Soviet Union in the East. To escape the humdrum prospect of sitting out the war”the very war he and his foreign policy team had worked so diligently to instigate“Roosevelt gave up on Hitler and instead focused upon Japan, Germany’s ally in the Far East under the Tripartite Pact with Italy…. Starting a war with Japan was a final desperation move. Only by deliberately cornering Japan and getting it to attack first could Roosevelt galvanize his home front, silence “the isolationists,” and rescue the British Empire and Soviet Union. England under Churchill was a non-factor on its own. As for Stalin, the Nazis were by then in Moscow’s suburbs. Time was of the essence. It was at this moment that Japan bombed Pearl Harbor.